Sometimes a movie, no matter how good or bad, strikes a chord that enables it to transcend traditional critical and esthetic judgments. Such is the case with Rawson Marshall Thurber's Central Intelligence. The subject of the movie is bullying and for all intents and purposes it falls into line with a whole bunch of recent silly comedies (The Boss, The Nice Guys) that gain traction by crossing the line with respect to political correctness or taste while at the same time dealing with shall we say "developmental issues." The idea is that a bullied high school student (Dwayne Johnson), who is the subject of a cruel prank, grows up to be the equivalent of Superman. He becomes a C.I.A. agent of extraordinary talents with a physique to match. Both sides of the movie’s protagonist (the before and after) are cartoons. The comedy is a little like Popeye’s biceps which are always ready to explode. But the subliminal effect of all the hyperbole is to detoxify trauma while giving it full imaginative play. 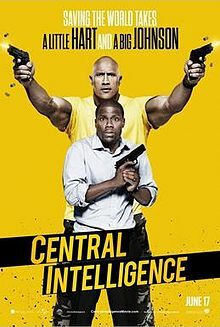 Central Intelligence manages to be both antiseptic (to the extent that the bullying that’s presented is so exaggerated as to defy realistic concerns) and at the same curiously psychological. The subject of the bullying comments that he's pushed the incidents that occurred years before far down. They run him, but he’s at the same time rarely, if ever, cognizant of them—despite the fact that the central line of plot has him glomming on to the class valedictorian and star athlete (Kevin Hart), the one person who ever treated him with respect. Melissa McCarthy makes a cameo appearance as another damaged soul—she’s cross-eyed—who’s reunited with her the weirdo on whom she’d had a crush. In the end, everyone marches into the sunset or rather into the CIA, an agency which, despite the clandestine neuronal like connectivity with which it’s portrayed, is not to be confused with the central nervous system.